You want to know something that I find crazy?! 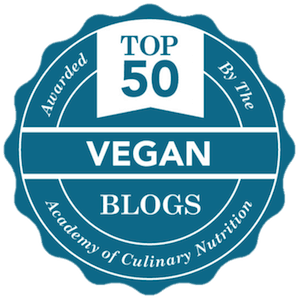 Some people in my “real” life (and by that I mean not just my internet friends) are starting to eat a more plant based diet. I’ve been eating a plant based diet for 5 years and have rarely chatted face-to-face with another friend or family member who gets as excited about nutritional yeast, beans and sweet potatoes as I do. Lately however, some really good friends are starting to make changes towards eating a plant based diet and I’ve even made some new “real life” friends who are vegan or vegetarian. It’s so nice to feel understood! For example, last weekend I got to cook a fully plant based BBQ dinner for my good friends’ rehearsal dinner. The groom and bride recently started to eat a more plant based diet and they, along with a few other members of the wedding party, wanted a fully vegan BBQ meal to enjoy after the wedding rehearsal. My friend asked me a couple months ago if I would be willing to cook the vegan meal for the plant based eaters in the group and I of course said yes! 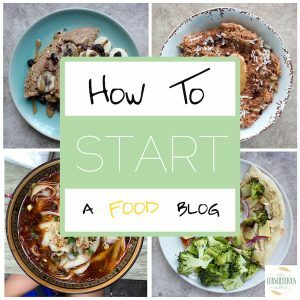 I had so much fun coming up with a vegan BBQ menu and testing out different recipes along the way. 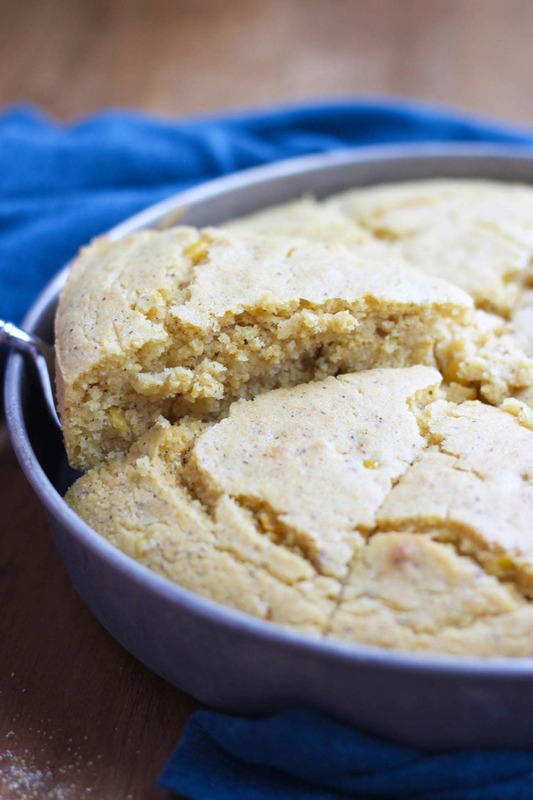 I knew immediately that I wanted to include cornbread in the menu, but didn’t want to use the Whole Wheat Vegan Cornbread recipe or the Vegan Pumpkin Cornbread Muffin recipe already on my blog. I wanted to come up with something new to challenge myself! I can’t remember where the idea to use creamed corn in a cornbread recipe came from. I must have been browsing the internet and seen a recipe calling for creamed corn and it just sounded delicious. I first had to make sure creamed corn was vegan, and yes, thankfully it is. 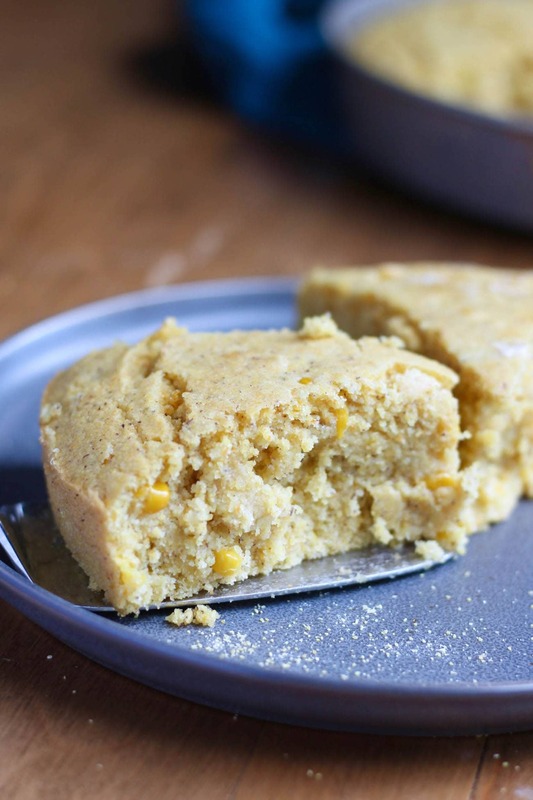 I also thought it would be perfect to use in this Vegan Creamed Corn Cornbread recipe, because I love my cornbread on the sweeter side and creamed corn is sweetened with some sugar. YUM! 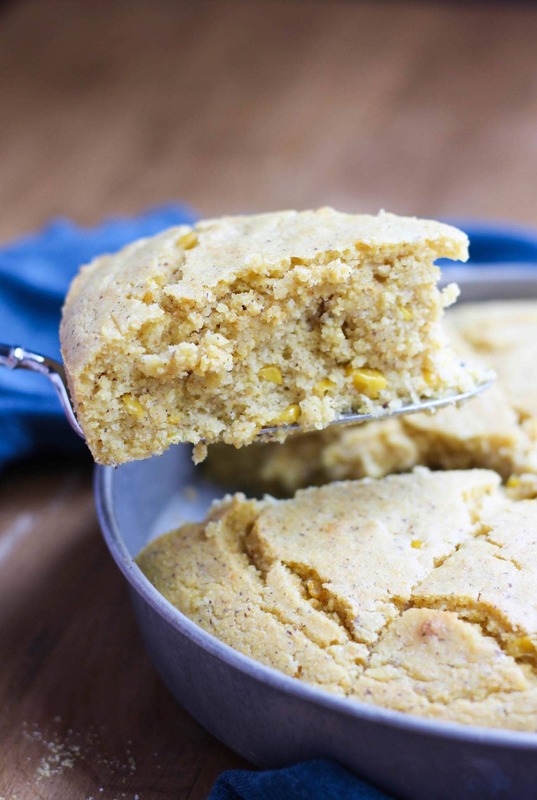 This cornbread is moist and studded with corn kernels for texture. It tastes amazing when eaten warm out of the oven with some melted vegan butter or even cold with some jam. 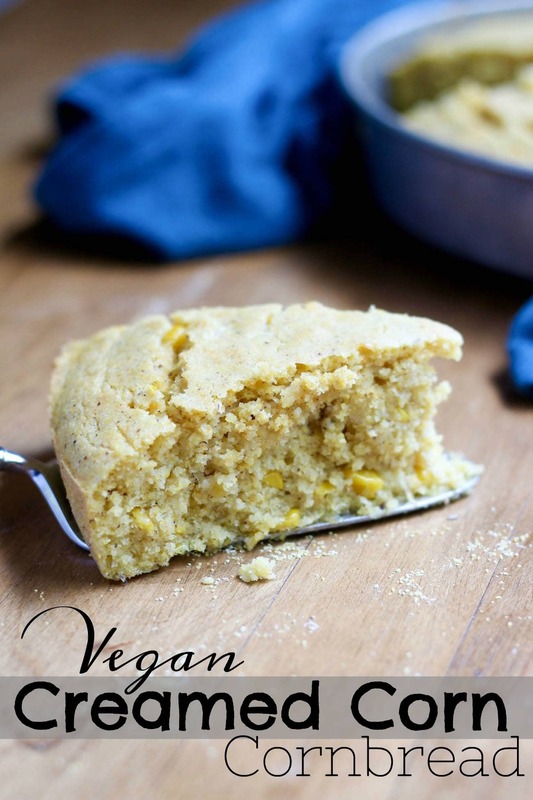 I love this Vegan Creamed Corn Cornbread as a snack or as a side dish with entrees, whether they are BBQ themed or not! If you’re looking for a “healthier” recipe, feel free to try using coconut sugar and whole wheat flour, but that may change the texture and cooking time. I’m sure it would still be delicious though! I would love to know whether you like your cornbread sweet or not! Let me know if you give this recipe a try and what you think. Leave a comment down below, take a photo and tag me on Instagram (@theconscientiouseater) and share this recipe with others! 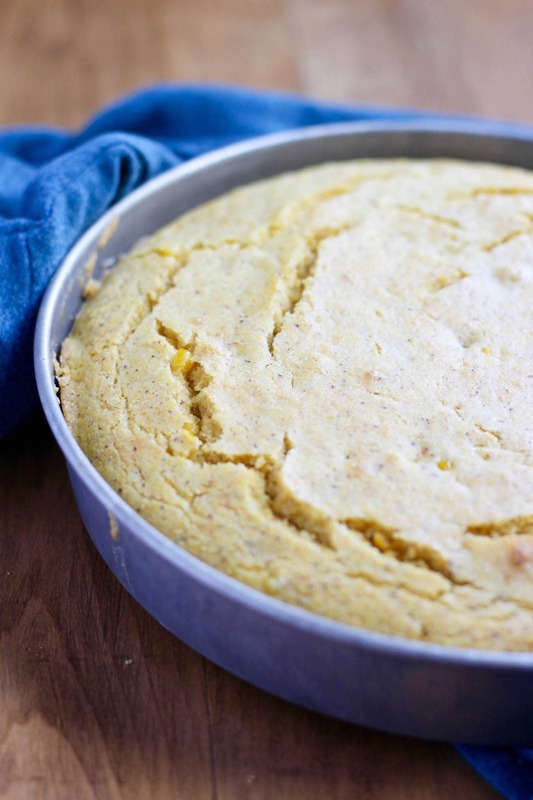 This egg and dairy free Vegan Creamed Corn Cornbread Recipe is a sweet and delicious side dish to pair with any entree! Preheat your oven to 400 degrees and spray a 9-inch pie pan with cooking spray. Set aside. In a small bowl, prepare your flax egg by whisking together 1 tablespoon of ground flaxseed and 3 tablespoons of water. Set it aside to thicken. Prepare the "buttermilk" by placing 2 teaspoons of apple cider vinegar into a 1 cup measuring cup and then filling the measuring cup the rest of the way with non-dairy milk. Set this aside to curdle a little. In a mixing bowl, whisk together the dry ingredients, from the flour to the baking soda. Add in the thickened flax egg, the "buttermilk", the creamed corn and the oil and mix everything until just combined. Pour the batter into your prepared pie pan and bake the bread for 22-24 minutes or until it starts to turn golden brown on top and a toothpick inserted into the center comes out clean. 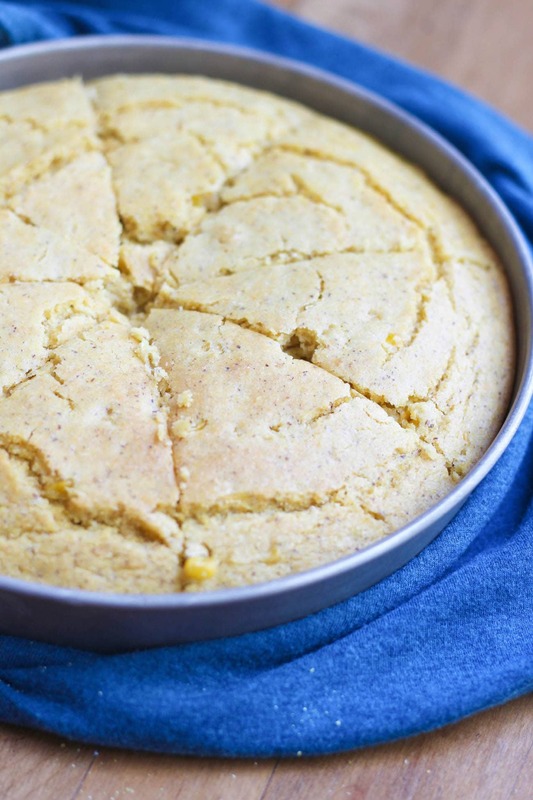 Remove the cornbread from the oven and allow it to cool before serving with vegan butter.